The Darrah sanctuary covers an area of 250 kilometres. Once serving to be a hunting ground of the Maharaja of Kota, it was announced as a protected area in the year 1955. Spread on a hilly terrain, the sanctuary is thickly wooded. 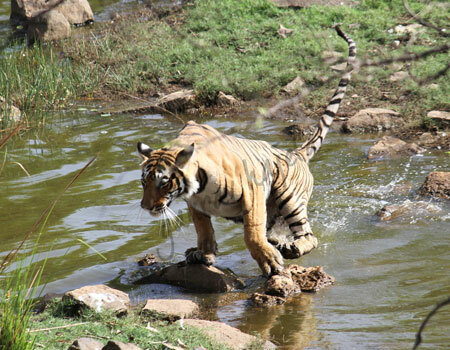 The tourists can spot wolf, cheetah, nilgai, deer and wild boar at this mysterious sanctuary. During your visit to the Darrah sanctuary you can stay in the Rest House at this sanctuary run by the Forest Department. Only basic amenities are made available to those who choose to stay here. A plethora of old temples and forts lie in close proximity to the Darrah sanctuary. The marvelous Jhalwar fort is situated very close to the sanctuary. The Zanana Khas it houses seeks special attraction. Then there is Jhairapatan which was built in the 10th century. It houses ruins of the Sun Temple. A series of certain other ancient temples is lined along the Chandrabhaga river banks. The sanctuary remains closed from July to September. Visiting the sanctuary is quite rewarding as it allows you to explore not only the wild side of Rajasthan but also its rich and traditional past.